UPDATE: Our beloved Mr. Fry crossed the rainbow bridge in August, 2017. T he first round of voting determined the top three semifinalists in each category, and a second round, featuring a combination of public and celebrity voting, will narrow the field to the eight category winners. The category winners will be flown to Los Angeles for our star-studded Hero Dog Awards gala on September 19, 2015, where we will reveal the top winner – 2015’s American Hero Dog! Mr. Fry has an amazing story to tell... call it kismet, fate or a miracle. On a cold winter night, a skinny, homeless hound wandered into a Fry’s food store outside of Phoenix. He learned how to open the automatic doors and enter the store to get warm. Arizona Greyhound Rescue got a call and met the Fry’s store manager and the big, blonde dog that needed a home. Hence, his regal name. It did not take long to realize that this was no ordinary hound. 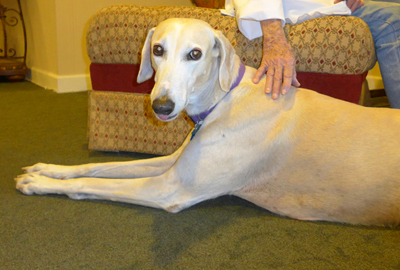 Mr. Fry is a Greyhound and Saluki mix and has personality plus! Under the loving tutelage of AGR president, Jean Williams and her husband Dan, Mr. Fry extensive training. Mr. Fry loved a challenge. 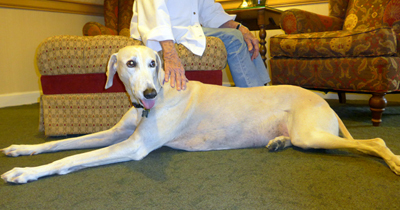 Through friends and supporters, Arizona Greyhound Rescue connected with the Director of Sales, Sunrise at River Road, a Tucson Assisted Living and Memory Care community. Sunrise is an amazing place where they incorporate animals into daily activities and welcome new residents and their personal pets. Based on the Sunrise principles of service having a house-dog that doubles as a canine companion was perfect. When Mr Fry first visited Sunrise he swaggered in like it had been his home forever and immediately visited residents in their suite, moved his bed to wherever the sun is shining (or out of the way of a vacuum), welcomed guests to the community at the front door, and continues to demonstrate their commitment to pets each day. Sometimes we think that this cold, wet, homeless hound knew his destiny: to help those who need his love and to make people smile. We found him but he found us and gives new meaning to Emerging Hero. Here is Mr. Fry's Contest Entry Picture... isn't he handsome? Here's a blast from the past... Mr. Fry and His Travellling Bed!